The first steps toward the unbundling of generation/production and supply activities from network operations were taken in the mid-1990s. 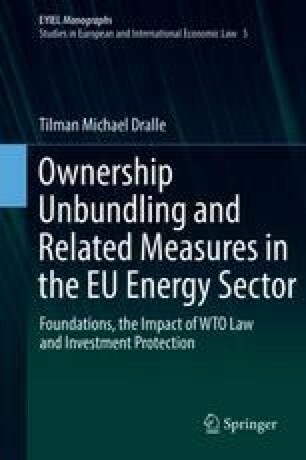 The EU’s First Energy Package, consisting of Directives 96/92/EC (electricity) and 98/30/EC (gas), contained pertinent provisions in this regard. Both Directives required integrated electricity undertakings to keep, in their internal accounting, separate accounts for generation, transmission and distribution activities (so-called ‘accounting unbundling’). They also provided that the Member States shall have access to these accounts. Furthermore, the Directives required Member States to ensure that transmission system operators did not disclose confidential information to other parts of a vertically integrated undertaking or to third parties. In addition, the electricity Directive declared that, unless the transmission system is already independent from generation and distribution activities, ‘the system operator shall be independent at least in management terms from other activities not relating to the transmission system.’ This requirement was absent in the corresponding gas Directive, although the Commission had originally proposed a similar provision for both sectors. The electricity Directive, however, failed to spell out how the unbundling of management should be achieved in practice.